Supplier & Trader of Steel Buildings. Our product range also comprises of False Ceiling, Metal Ceiling and Roofing Sheet. 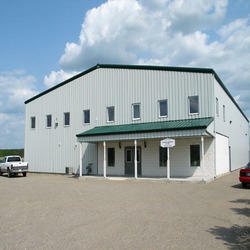 We introduce ourselves as the leading trader and supplier of a huge assortment of Steel Buildings. These buildings are very helpful for quick construction in many sites. We make sure to use supreme quality raw material in the manufacturing so as to provide a best quality product to our prestigious clients. Our buildings are presented in a range of dimensions and designs that are fully tested before dispatching them to market.